Is The New Jeep Wrangler Unlimited Cheaper To Lease Than The Old One? Whenever a complete redesign of any vehicle is about to arrive in dealerships, many assume there are good deals to be found for the outgoing model. Typically that’s true, but not entirely so in the case of the . did some digging and numbers crunching and came up with some interesting figures regarding Wrangler lease prices. 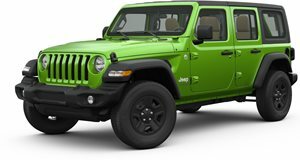 Right now, the outgoing JK Wrangler Unlimited Sport can be leased at $284 for 36 months with $2,499 due at signing, based on an MSRP of $30,390. So figure a $353/month effective cost (which takes into account finance charges) and a yearly mileage allowance of 12,000 miles. However, upon further examination of the new JL Wrangler Unlimited Sport’s lease offer, that outgoing model’s monthly payment isn’t so hot. At the moment, that new JL Unlimited is listed at $283 for 36 months with $2,499 due at signing, and based on an MSRP of $33,690. Annual mileage is the same. The effective cost comes to $352/month. Yes, that’s only $1 less per month for a vehicle that has a $3,300 more MSRP. How is this possible? believes the reason boils down to underlying residual values. For example, the JK Unlimited Sport lease is based on a residual of 71 percent, while the JL Unlimited Sport’s is based on a residual of 75 percent. That also happens to be the highest of any other JL Wrangler style. It’s important to know that residual values vary by style and it’s no exception in the Wrangler’s case. The four-door Unlimited models just so happen to have better residuals. Because of this, the two-door JL Wrangler could actually have a higher monthly lease. Given everything, the question is whether or not leasing the outgoing JK Wrangler Unlimited is worth it. Based on the above figures, no way. But some dealerships could be anxious to clear their lots to make way for the new Wranglers, so there could be some negotiating room. Thing is, because the over the old one, why even bother?